GO BEYOND TRAVEL. FIND TRANSFORMATION. Scholé EXPLORE: Panama is a journey to paradise. Amidst the tropical rainforest, beautiful beaches and Pacific ocean waves, join us to create connection and a piece of paradise within yourself. We are returning to Sansara Resort November 24-30, 2019 (arriving in Panama City on Saturday, November 23) to give thanks and grow through the practices of yoga, meditation and the opportunity to explore letting go of fear in Sansara’s acclaimed surfing program designed to help beginners easily take to the sea. Payment plans with installments made across the year are available to help everyone find their place in paradise. Deepen your practice with yoga, meditation and Scholé NIDRA led by Scholé Yoga partners Micah Scholes and Shannon McPhee, in the shaded outdoor yoga pavilion looking out over the ocean. World-class mats, props and a stereo system are all on site so that you can pack light. 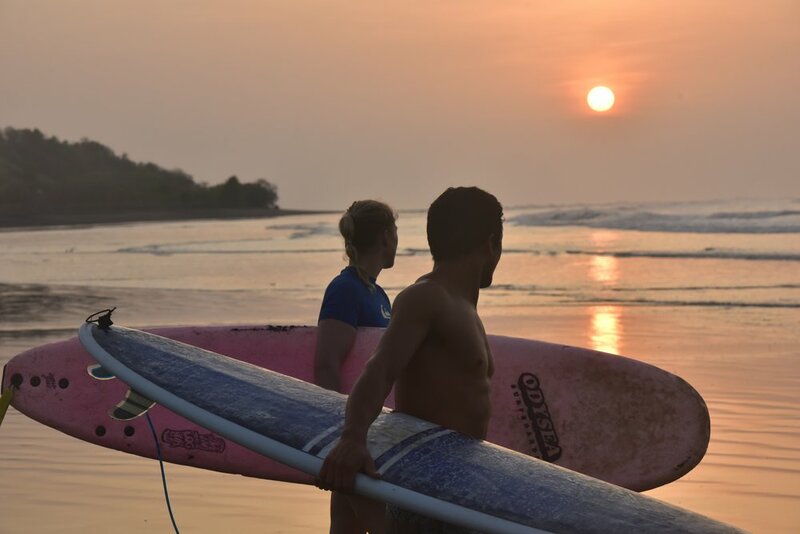 Our schedule will be built to accommodate those who wish to add a surf package to their retreat experience, with plenty of options to ensure connections between those who would like to take to the sea and those who prefer to spend more time on shore. HOW: Email shannon@scholeyoga.com to begin your booking today. Payment plans are available for those who wish to make installments across the year. Sansara Resort is a secluded boutique property on the Pacific Coast of Panama. Located five hours from Panama City, this secluded gem features world-class, healthy meals, modern rooms and amenities, an outdoor yoga pavilion and a renowned Learn-to-Surf program. While Scholé EXPLORE in Panama is our first international retreat, our retreat coordinator, Shannon, has been adventuring around the world for years. In fact, this passion has brought her to explore cultures on all five continents. The search for our retreat home, Sansara Resort, has been long as we wanted to find a retreat home that felt like exactly the right fit for Scholé Yoga - one that is beautiful, mindful, modern, and affordable - and we are so excited to share Sansara with you. Sansara is a secluded hidden gem, a true oasis in the world of modern tourism. It is polished, stylish and carefully curated by its owners who also live on site and manage the property. It features two beautiful quad occupancy rooms, a triple room, and eleven double occupancy cabañas. The air conditioned rooms are airy, modern and designed to merge with the breezy foliage that cocoons the property. Organic bath products are featured in the rooms, along with mini fridges to ensure you can keep any snacks or drinks cool and refreshing. Wifi is complimentary, so you can easily stay connected with the folks back home. Located five hours from Panama City in a small, peaceful fishing village with only a few hundred residents, Sansara is a profoundly special place architected to facilitate connection, healing and growth. While the beach at Sansara is steps away from the Pacific Ocean, the resort also features a saltwater pool if you prefer to swim on shore. SUP boards, kayaks and bicycles can be borrowed at no extra charge, and massage services beside the ocean or indoors are available for those who would like to add spa experiences to their adventure. Waterfall hikes, horseback rides and fishing trips can be arranged with a guide. Three meals per day are included in your Scholé EXPLORE retreat package at Sansara, with breakfast and lunch served from a diverse menu of options on demand. Every evening, we will enjoy a communal dinner, prepared to help us all connect over a delicious shared meal. Vegetarian, vegan and other dietary needs are well cared for at Sansara. We believe that great food is essential to both health and our travel experiences, and stellar cuisine is critically important to us. Sansara shares this belief. Three healthy, vibrant meals are included in your retreat package each day, making this adventure and incredible value. With kombucha on tap and microbrews available (alcohol is an extra charge) for those who desire, the Sansara menu is a delight. A wide range of delicious breakfast and lunch options are served menu style to accommodate flexibility in when you prefer to eat, and we will enjoy dinner as a group every evening to deepen connection with each other. Sansara offers healthy, delicious meals for everyone, including those who choose to enjoy vegetarian, vegan, and gluten free dining, as well as other special needs. Sansara offers modern quad, triple and double occupancy to make paradise affordable for a wide range of guests. Designed with care, the two quads and one triple room offer twin beds, while all double occupancy cabañas can be arranged with two twins or one king bed. We believe in making yoga accessible to as many people as possible, and searched the globe to find a resort that balanced world-class beauty, healthy and delicious cuisine, as well as affordability. Rates for Scholé EXPLORE in Panama start at $1790, which includes quadruple occupancy lodging at Sansara, three meals on site, and transportation with our retreat group from and to Panama City. Flights, hotel stays the night before and after departure, surf school, alcohol and incidentals are not included to ensure that everyone can book according to their own budget and travel preferences. Panama City offers world-class hotels at great rates, with rooms ranging around $100-150 night. Sansara partners offer great discounts at the Central Hotel Panama, which are available to our group before and after our retreat for those who wish to stay longer in Panama City. Shannon will provide details on booking at these properties with our group discount to our retreat guests once they have registered and made their deposits. *Double rooms feature king sized beds and can be fitted with two twin beds for those who wish to share a room but sleep separately. Please note that these are shared room rates. If you would like to stay in a room by yourself, let us know and we can inform you of the rates for single occupancy. Retreat guests are welcome to inform us who they would like to share a room with when booking, or to make new friends with the incredible people in our Scholé Yoga community. In addition, we may need to amend bookings in quad or triple rooms to ensure costs can be kept as low as possible for everyone. Please know that we will contact everyone affected in the case that this is necessary so that you are fully aware of any changes to your requested booking. What’s not included: Again, please note that flights, hotel in Panama City before and after the retreat, alcohol, surf packages, massages and incidentals are not included in the retreat price. Payments are not refundable after the end of the Early Bird deadline of August 15, 2019. For those who are interested, Sansara offers two, three, four and five day learn-to-surf packages designed to help beginners overcome fear and learn to take to the sea. Guides are available for experienced surfers, and all surfing gear is available on-site at Sansara, again helping you to pack light for adventure. Rentals are available for those who would like to take to the sea but choose not to participate in the Learn to Surf program. The below fees are paid to Sansara Resort on site, and surf package selections can be confirmed when we arrive at the resort. Depart from hotel in the Casco Viejo area around 9 AM. Drive in our group shuttle to the Panama Pacific Coast, arrive at Sansara around 3 PM for orientation and welcome. Evening yoga and meditation to help us ground and connect. Daily Scholé Yoga, meditation and NIDRA practices available, optional surfing and local adventures with plenty of opportunity to elect to participate or choose time on your own. We will offer a special schedule to help us all connect in gratitude on Thanksgiving Day. Depart Sansara Resort for Panama City in our group shuttles. Sansara advises guests flying home on 11/30 to book flights that depart after 6:00 PM. Depart Panama to return home (or optionally extend your stay to explore more of the city and country). For those who need more financial flexibility, payment plays with six months’ no interest financing are possible with a $500 deposit to secure your spot. Payment must be completed in full by October 5, 2019. Guests are welcome to pay in full or in installments to help accommodate financial requirements. Please email Shannon McPhee at shannon@scholeyoga.com to begin the booking process. Ready to go? Have a few questions? Email retreat coordinator Shannon McPhee (shannon@scholeyoga.com) to get connected!